FORT LAUDERDALE/DAVIE, Fla. – Nova Southeastern University (NSU) officially named its arena in honor of community leader and automobile dealer, Rick Case at a special ceremony on January 19, 2017. 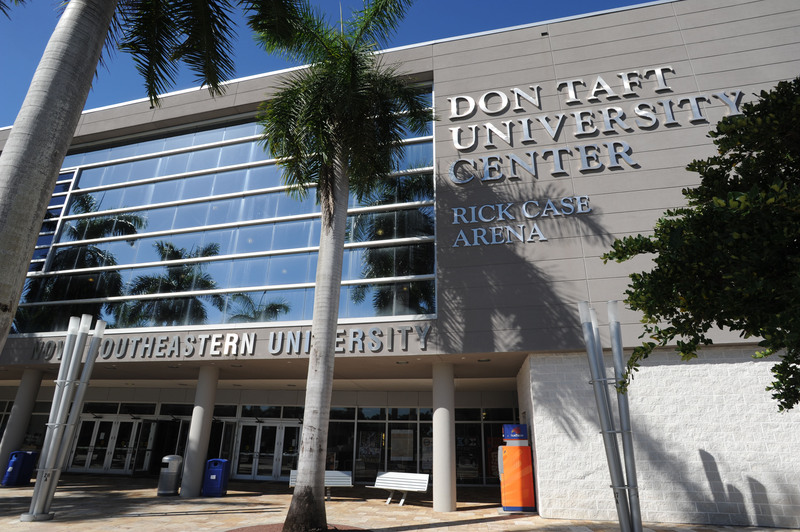 The arena is located at the Don Taft University Center, an active multipurpose facility focused on student programs and services, located in the heart of NSU’s Fort Lauderdale/Davie campus. Rita and Rick Case’s gift to NSU established a scholarship endowment to attract outstanding undergraduate students as part of Realizing Potential, NSU’s first comprehensive fundraising campaign. This is the largest philanthropic campaign in the university’s history which aims to raise $250 million for students, faculty, and 21st century education. 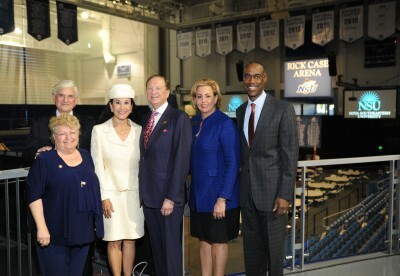 The naming of the arena is in honor of the Cases’ gift and ongoing support of NSU. Local dignitaries joined Rita and Rick Case and Dr. Hanbury to celebrate the official unveiling of the “Rick Case Arena” name. Remarks were made by esteemed guests including Robert W. Runcie, superintendent, Broward County Public Schools; Scott Israel, sheriff of Broward County; and Judy Paul, mayor of the Town of Davie. The arena opened in 2006 and is a 300,000-square-foot facility that can seat up to 4,570. In 2016, approximately 150,000 people attended more than 200 events at the venue. The arena is home of the NSU Sharks Athletics teams, including intercollegiate men’s and women’s basketball and women’s volleyball. Comprised of three full-size courts and three concession stands, the facility offers flexible staging and live concert layout options. The venue has hosted a wide variety of events, ranging from college fairs and community gatherings to large-scale entertainers and legendary icons, including Bob Dylan, Kevin Hart and His Holiness the Dalai Lama. The Rick Case Arena also hosts NSU and local public and private high school graduations ­­– more than any other facility in Broward County. The Miami Dolphins use the arena for several annual events including their cheerleading audition finals. The arena is further available for special events such as charity galas, corporate banquets and private parties. The in-house gourmet kitchen serves up to 1,000 guests for a seated dinner. Rick Case, CEO and founder of Rick Case Automotive Group, one of the nation’s most recognized automotive groups, joined NSU’s Board of Trustees in November 2002 and has served on the Building and Grounds Committee that has orchestrated more than $100 million and over a million-square-feet of development for the university during the last 15 years. The Case family hopes to raise awareness about the university by promoting the arena and encouraging many different groups and organizations to have their meetings and events there. “It is our hope that the Rick Case Arena will bring more attention to all of the great attributes NSU has to offer and help improve the community as a whole,” said Rick Case. With a community-driven mindset and a commitment to philanthropy, life and business partners, Rita and Rick Case have dedicated their lives toward supporting and improving their community by developing and leading fundraising and awareness efforts that raised more than $50 million. This year, Rita and Rick celebrate the 55th anniversary of the Rick Case Automotive Group dealerships, which includes 16 Rick Case dealerships in South Florida, Cleveland and Atlanta. The Rick Case brands include Maserati, Acura, Audi, Hyundai, Volkswagen, Kia, Mazda, FIAT, Alfa Romeo and Honda Automobiles & Motorcycles, including the World’s Largest Honda, Hyundai, Kia and Volkswagen dealerships located in Broward County. Recognized as a top performing dealer group in the U.S., they continue to receive industry awards for their outstanding performance and achievements, such as being featured in Automotive News as the only 2013 National All-Star Dealer for the Privately Held Dealer category out of 17,000 in the country. About Rick Case Automotive Group: The Rick Case Automotive Group commemorated their golden 50th anniversary in 2012, and Rick Case wrote a book, “Our Customers, Our Friends,” a history of his 50 years as a car dealer. This book sells for $24.95 but is available free to anyone that visits any Rick Case dealership. Located in South Florida since 1986, The Rick Case Automotive Group is owned and operated by the wife and husband team of Rita and Rick Case. Rick Case Automotive Group’s national headquarters are located at 14500 W. Sunrise Blvd. in Sunrise, FL. For more information about The Rick Case Automotive Group, visit rickcase.com.